We also broke into groups of five to prepare a scenario and present it to the rest of the class. Our scenario was very timely in light of the H1N1 outbreak as it involved CERT members being asked to staff a Point of Distribution (POD) to give out medicine to the public. The scenario asked how we as CERT members would deal with a request to report to a POD for a 12-hour shift if our husband/wife/partner was out of town and we had three children at home. In our group, we discussed how that would involve a tension between being a CERT member and a parent. Most of us would feel responsible to our family first, but we raised the possibility of finding a neighbor or family member Â to babysit our kids or alternatively bringing them to the POD as they would probably need to get the medicine as well. Scenarios are a great way of putting you into a situation and raising questions that should be addressed in advance. One of the takeaways that came out of our group was that we felt individual CERT teams should be discussing the issue of how members should deal with a situation where they are deployed but might have child care or other domestic responsibilities. 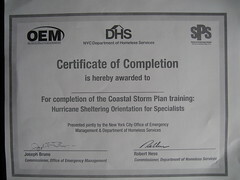 2) Coastal Storm Plan Training: Hurricane Sheltering Orientation For Specialists –Â This training is done completely online. It is a very interesting exercise for CERT members who might be asked to staff an evacuation shelter in the event of a major storm in the New York area. City officials have developed a comprehensive coastal storm plan which CERT members play an important role. A couple years ago, I participated as a “storm evacuee” during a major hurricane drill in downtown Brooklyn so I was somewhat familiar with sheltering procedure. However, this interactive training offered detailed descriptions of the different responsibilities a CERT member might have during a storm emergency. Throughout the web training, users are given various tricky situations that would come up and asked to come up with the right solution. 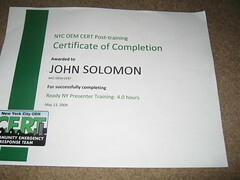 3) Ready NY Presenter Training — The third class I completed was focused on training CERT members to offer public preparedness presentations in the community. 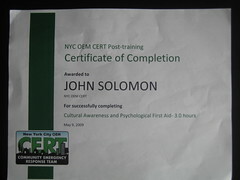 It aims to “introduce you to the concepts of the Ready New York program such as Knowing the Hazards, Making a Plan, Evacuation and Sheltering in Place, Creating a Go Bag, Creating an Emergency Supply Kit and Staying Connected;Â Review basic instruction techniques;Â Give you the opportunity to practice your public presentation skills;Â Prepare you to participate in Ready New York presentations and events throughout New York City.” Initially, a couple of OEM officials briefed us on the basic Powerpoint Ready New York presentation and offered us some speaking tips. We all were then broken up into groups and asked to present a few of the slides. We will soon be receiving evaluations from the OEM staffers who observed our presentations. I hope to have the opportunity to do some Ready New York presentations in the near future. As you can see in above photos (taken by my daughters), after completing each of these trainings we were given graduation certificates. First of all, at our ages it’s nice to be called a graduate of anything. But more importantly, these certificates, as I have written about before, are a small tangible recognition that make volunteers feel good about their service and help engender a team spirit among CERT members.